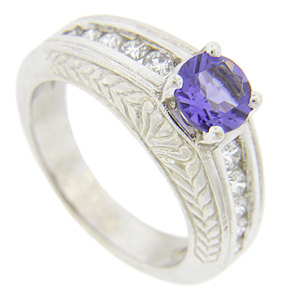 Crafted of 14K white gold, this tanzanite and diamond modern engagement ring is set with a round tanzanite measuring approximately .90 carats. .25 carats of of graduated, channel set diamonds add sparkle to the ring's shoulders. 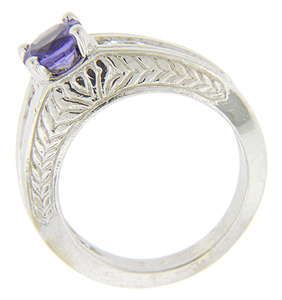 The ring is replete with detailed leaf engraving on its front and back. Size 6 3/4. We can resize.